Biotech companies are experiencing an unprecedented run of scientific successes, but biotech stock valuations have never been more expensive. 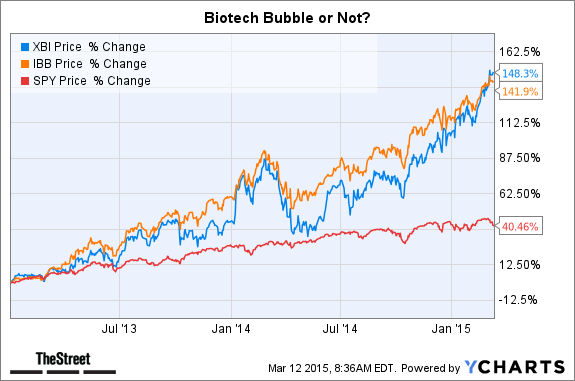 BOSTON (TheStreet) -- We are in a biotech stock bubble. Except we're not. I feel conflicted on the burning question of the year. Biotech companies are experiencing an unprecedented run of scientific successes and the business of biotech is fundamentally stronger than ever. These facts are undeniable. But it's also true that biotech stock valuations have never been more expensive. This includes the price that companies are willing to pay for specific biotech assets, some of them barely out of test tubes. It's hard to imagine biotech valuations rising in perpetuity. Something has to give, eventually. Right? J. Hodges, a reader, sent me an email in which he expressed his belief that we are in the midst of a biotech bubble. But he also wonders if the flood of money into the sector -- driving valuations higher -- is the new normal. Is it possible for these stocks to stay pumped up? The simple answer is yes. A lot is going right for biotech bulls right now. Let's make a list. 1. The sector is translating a deeper understanding of science into truly innovative therapies for serious and fatal diseases. Cancer immunotherapy is the real deal. Cystic fibrosis. Hepatitis C. Orphan diseases. Even gene therapy, once a medicinal black hole, is roaring back with a legitimate shot at curing diseases once considered incurable. 2. The FDA is approving everything. Once considered an obstacle or at least a significant risk to successful drug development, the FDA is now the House of Yes! It's no longer a question of whether a drug will be approved, but how fast. 3. Big Pharma is burdened with thin pipelines but has lost its appetite for R&D. Big Pharma carries lots of cash and wants to spend it, sometimes indiscriminately. In other words, Big Pharma is buying innovation and growth from biotech. It's a seller's market. 4. For all the talk and worry about the long-term sustainability of drug pricing, there are still few industries outside of health care where companies can raise prices year after year on the same or similar products with no push-back from customers. Biotech has pricing power. You don't see Apple (AAPL - Get Report) selling the original iPhone today for $5,000. But there are plenty of old drugs on the market today priced multiples higher and racking up enviable sales growth. 5. Where else can investors go for such juicy returns? Biotech has been the top-performing market sector for the past four years. It's leading the pack again this year. What do institutional investors think about the biotech sector? They love it for all the reasons stated before. They hate it because other investors -- not them, of course -- are too indiscriminately bullish. Some boats deserve to be swamped by the rising tide, not lifted. The investors who need to be hedged are depressed because they can identify good biotech shorts, but few, if any, are making money. Everyone is looking over their shoulders, worried that someone else will decide valuations are too high and start selling, which will beget more selling. No one wants to be the guy who sells first for fear of missing the next leg up. What would bring valuations back to where they were a few years ago? A few factors could sink valuations. Medicare gaining the power to negotiate drug prices. Pharmacy benefit managers taking a hard line against the pricing of cholesterol-lowering PCSK9 drugs and winning major concessions. Imbruvica sales flat-lining. A CAR-T therapy killing or seriously harming a cancer patient. The FDA being forced to remove a high-profile drug from the market because it overlooked serious side effects. Biosimilars winning big market share at lower-than-expected prices. Why are you so convinced that this is a bubble? Let's agree that from a scientific standpoint, biotech today is on much firmer ground than when the last valuation bubble burst in 2000. Back then, the promises made about diseases being cured due to the genomics revolution went unfulfilled. Today, real progress is being made. I started covering biotech stocks in 2001, so I missed the run-up to the last bubble. But in the late 1990s, I was living in San Francisco and writing about the Internet and dot-coms. That was a bubble. Oh boy, was it ever a bubble. Biotech today is a far more grounded industry. Nonetheless, it's worrisome, even alarming, when preclinical start-ups are given billion-dollar valuations. There's a lot of mental gymnastics necessary to justify the price tags and price targets of certain biotech stocks today. It seems like a lot of folks have forgotten about risk. Certain sell-siders are using 100% probability of success in their revenue models for drugs still in clinical trials! Yes, I'm talking about you, Alethia Young of Deutsche Bank. Assuming 0% risk in biotech in 2015 is the counting-eyeballs dot-com currency of 1999. I'm conflicted about the biotech bubble. The debate will continue, that's for sure.